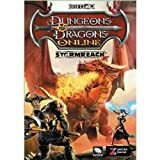 Dungeons & Dragons Online(R) : Eberron Unlimited(TM) interactive video game (C) 2010 Turbine, Inc. (C) 2010 Wizards of the Coast LLC (C) 2010 Atari, Inc. All rights reserved. Dungeons & Dragons Online, Eberron Unlimited, Dungeons & Dragons, D & D and Wizards of the Coast and related logos are trademarks or registered trademarks of Wizards of the Coast LLC in the U.S. and/or other jurisdictions, and are used with permission. Hasbro and its logo are trademarks or registered trademarks of Hasbro, Inc. in the U.S. and/or other jurisdictions, and are used with permission. Atari and the Atari logo are trademarks owned by Atari Interactive, Inc. Turbine and the Turbine logo are trademarks or registered trademarks of Turbine, Inc. in the U.S. and/or other jurisdictions. The ESRB rating icons are registered trademarks of the Entertainment Software Association. All other trademarks are the property of their respective owners.